Google Pixel Phone : Google has launched new Augmented Reality stickers - 3D objects and characters for Pixel and Pixel 2. These give a totally new feel and experience to the users as they express themselves with virtual characters and emojis that come to life. There is lot of choice for the users to choose the AR stickers and to create their own stories. This is an exclusive feature for Pixel devices which works right from the camera app. 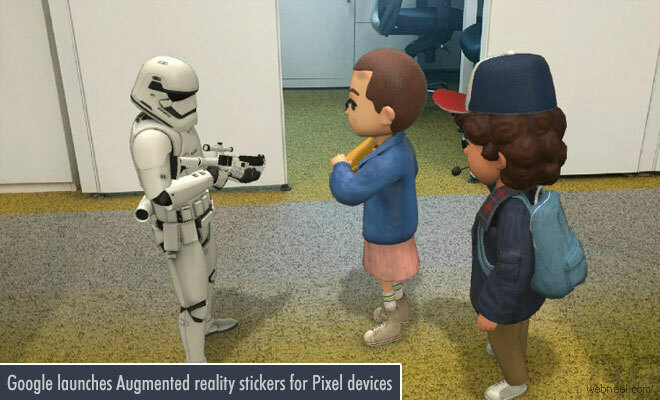 The AR features include stickers from Star Wars and Stranger Things. Pixel phones with Android 8.1 and above will see this new feature. According to Google's release, "Users can team up with "Star Wars: The Last Jedi" characters like BB-8 and R2-D2, or even stage fun moments with Eleven, the Demogorgon, and other characters from Netflix's 'Stranger Things'. Or use Foodmoji stickers to make it clear that you're feeling hungry, 3D Text for when you really want to title your life or shoot a celebratory video at a New Year's party complete with animated AR balloons, cake, and champagne". In order to use the option users need to ensure their device has the latest software and need to open the Google camera app, open the left navigation menu, and select 'AR Stickers' from the camera modes. The characters can be dragged onto the camera feed and be placed in the required place.